Can Gov. Inslee deliver America's first carbon tax? Jay Inslee, Washington state's Democratic governor, is one of America's leading climate evangelists. Now, as he seeks to pass a major policy limiting emissions, he's facing perhaps the biggest political victory of his career, or his sharpest defeat. As a congressman, Inslee was instrumental in the passage of a federal cap-and-trade bill in 2009, only to see it die in the Senate. Tackling carbon emissions has been a consistent theme ever since he assumed the corner office in Olympia, the state capital, in 2013. He's even written a book on the topic. Titled "Apollo's Fire: Igniting America's Clean Energy Economy," it compares the effort to fuel the world on clean energy and slash emissions to the space missions of the 1960s. But Inslee has precious little to show for all his proselytizing. The cap-and-trade proposal he helped champion in the House came to nothing. As governor of Washington, he's proposed a cap-and-trade system and a carbon tax. Both met an unceremonious end in the state Legislature. More recently, a court struck down his executive order to implement an emission cap (Climatewire, Dec. 20, 2017). Inslee hopes 2018 will be different. With new Democratic majorities in the state House and Senate, the governor has resurrected his carbon tax proposal (Climatewire, Jan. 10). It would start at $20 per ton in the summer of 2019 and increase by 3.5 percent annually after adjusting for inflation. The majority of the revenue would be plowed into emissions-reduction programs and a transition fund to help low-income communities cope with rising gasoline and electricity prices. The governor has reason to be optimistic. Microsoft Corp. and Puget Sound Energy, the state's largest utility, have come out in support of pricing carbon. Clean energy jobs are on the rise. Solar is the largest employer in the state power sector, with roughly 5,600 employees, and there are more Washington workers employed in energy efficiency (61,889) than the motor vehicle sector (32,401), according to federal figures. 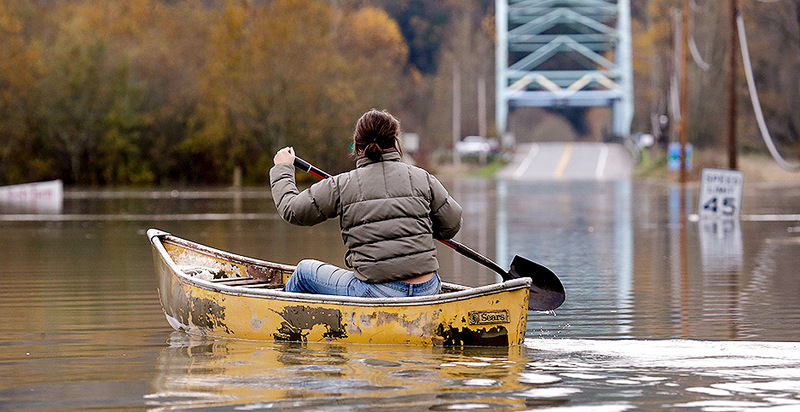 Washingtonians have also been offered a firsthand glimpse at the threats of climate change in recent years. Last summer, forest fires not only scorched the Cascade Range but managed to jump the Columbia River. "There was ash on the hoods of people's cars in Seattle. I've lived here 66 years," Inslee said in a recent interview with E&E News. "That's never happened before." Take all those factors together and, he insists, "it's a new day for this discussion." Passing a carbon tax in Washington state would be to U.S. climate hawks what Massachusetts' adoption of universal health care in 2006 was to America's health care debate. While California has adopted an economywide cap-and-trade program, no American state has managed to impose a carbon tax. Proponents say that has hindered federal efforts to put a price on carbon. Washington could change that. The Evergreen State has a relatively small emissions profile by national standards. The 75 million metric tons of carbon emitted in 2015 ranked 25th among states, according to Department of Energy figures. Transportation accounts for 57 percent of Washington's emissions, followed by the industrial sector at 17 percent and the power sector at 14 percent. While emission reductions under Inslee's plan would be relatively small in global terms, it would outline a path for broader action, said Noah Kaufman, who leads the carbon tax research initiative at Columbia University's Center on Global Energy Policy. Right now, there are relatively few examples of how a carbon tax would work, he noted. British Columbia's levy of 30 Canadian dollars (about $24) per ton is one of the longest-standing carbon taxes. That makes it one of the best data points for studying its impact on emissions and the wider economy. Emissions fell 5.5 percent between 2007 and 2014, according to the provincial government. At the same time, British Columbia's population grew 8 percent, and gross domestic product increased by 12.4 percent. Emission reductions in British Columbia have stalled since 2013, when the tax price was frozen at CA$30 per ton, but the newly installed New Democratic Party has proposed an annual increase of CA$5 ($4) per ton that would top out at CA$50 in 2021. Still, more data points are needed to assess a tax's impact on emissions and the economy, Kaufman said. "It's still pretty early days. I think the reason you see B.C. cited all the time is it's probably the best example of an economywide carbon tax that has been in place for a number of years," he said. "There is not a lot of evidence out there." He added: "Hopefully, we'll have a better idea the next time this debate reaches the U.S. federal level." For that to happen, Inslee has to sell his fellow Washingtonians on the idea. The governor has included a list of sweeteners aimed at thwarting the traditional arguments against a carbon tax's costs. The bill calls on the state Department of Commerce to identify trade-exposed industries, which compete globally and might face plant closures from rising energy costs, and allow them to apply for an exemption. Aircraft fuels, including those used in agriculture, would also get a pass, as would the state's lone coal plant in Centralia, which is set to retire under a previous state agreement in 2025. Alternatively, out-of-state power generation imported to Washington would be subject to the levy. Utilities would be allowed to submit carbon reduction plans and receive credits against the tax for investments that reduce emissions. The proposal hints at the limits of Inslee's climate ambitions. The governor has spent much of the last year promoting the idea of regional climate action (Climatewire, Nov. 27, 2017). He was one of three governors to found the U.S. Climate Alliance, which aims to hold states to the goals of the Paris climate accord. Instituting a carbon tax could complicate regional cooperation. California last year renewed its cap-and-trade program. Oregon lawmakers are hopeful they can pass a cap-and-trade bill of their own next month, which would pave the way for the state to join California's program. Inslee acknowledged that pursuing an alternative form of carbon regulation complicates efforts to collaborate with neighboring states, but expressed confidence it would not thwart it. "If it was me, I'd probably prefer a cap-and-invest system, but it [a tax] has more support" in Washington, the governor said. "Ideally at some point we'll have regional cooperation on a price signal. That's not on the short term. With California, we've had a cap-and-invest system. I think the important thing for each state in the short term is to have an investment vehicle and some price signal. So we have consistency with other areas. They're not mutually inconsistent." First, Inslee has to sway his colleagues in the Legislature. A wide swath of business interests remain wary of the proposal. The Association of Washington Business, the state's most powerful trade group, has raised concerns about rising energy costs and their impact on businesses. The group is pushing for fixes to the bill. In Inslee's proposal, exemptions to trade-exposed businesses would be decided on an annual basis. AWB says businesses need more certainty and that exemptions should be made for longer periods of time. It wants to see an auditing system for determining the most cost-effective forms of emissions reductions and to avoid duplication with other state and local environmental laws, said Mary Catherine McAleer, the group's government affairs director. "We recognize that there is momentum to pass a policy and there is a momentum behind an initiative," McAleer said. "If there is going to be a bill, we're not going to be carte blanche against it, but we're going to ask for a long list of provisions." It's unlikely, she said, that lawmakers will make enough changes for the group to support the final bill. Republicans are also skeptical. While there have been rumblings about a Republican carbon plan, one has yet to emerge. Some Republicans, meanwhile, have been openly hostile to Inslee's proposal. Costs are their chief worry. Estimates by the governor's office show that electricity bills would increase 5 percent by 2035, while prices at the pump would increase 11 percent. Proponents argue those increases would be moderated by clean energy investments. But critics are not convinced. "If Washington state passes Jay Inslee's carbon tax, there will be no impact on climate. If Washington doesn't pass Jay Inslee's tax increase, there will be no impact on climate. Washington state cannot drive worldwide climate trends," said state Sen. Doug Ericksen (R), a longtime antagonist of the governor. "But the concept we are going to raise taxes on working families to drive their cars and heat their homes, and that's going to solve any problem, doesn't make any sense." Inslee's plan has also attracted national criticism. The Wall Street Journal's editorial page recently dinged the governor for employing a climate adviser based in Morocco. The paper has been widely critical of Inslee's efforts to price carbon. Legislative leaders in Inslee's own party likely represent a more serious challenge for the governor. Democrats hold slim majorities in the House and Senate, and their leaders are uneasy about passing a new tax in an election year, observers said. "Both Democratic leaders, while interested in the topic, are nervous about what they can get their members to vote on," said Jeff Johnson, president of the Washington State Labor Council, AFL-CIO. Labor interests are backing Inslee's push to pass a carbon tax this year. That represents a change from 2016, when labor opposed a ballot measure calling for a carbon tax. (Inslee was also opposed.) Their chief concern, then: Carbon revenues would have to be used to offset other taxes. Inslee's proposal this year calls for half of the revenue to be spent on carbon reduction programs, like electric vehicle charging stations and energy efficiency initiatives, while 35 percent would be spent on climate mitigation measures meant to steel the state against fire and drought. The remaining 15 percent would be spent on helping low-income communities deal with rising energy costs. Labor is pushing for Inslee to better define how transition money would be spent and is calling for an oversight committee to be formed to monitor the state's carbon regimen. A ballot measure is likely if lawmakers fail to act. Johnson said a coalition of labor, environmental and minority groups will unveil a proposed question next month, just in case legislators don't get the job done. "We need to be ready, and we need to be collecting signatures and educating on the initiatives," Johnson said. "If we could pass a bill that had many of the values that we're imbedding in the initiative, that would be tremendous. We would love that." The governor, for his part, appears ready to spend some political capital on what could be a legacy-defining moment. In 2008, the Legislature passed a law that set a target of cutting emissions to 1990 levels by 2020. The law envisioned cutting emissions 25 percent further by 2035 and 50 percent of 1990 levels by 2050. Without a carbon tax, the state risks falling short of those ambitions, Inslee said. "The Legislature made a promise to Washingtonians over 10 years ago," he said. "They adopted into law a commitment and a statute for the state to reduce its carbon pollution, and they have not fulfilled that. That promise will be broken if they don't act this session." Failure to act would represent a familiar outcome for Inslee's climate hopes. But if lawmakers do pass a bill, the governor will be able to add a theme to his climate sermons: deliverance.